Situated on the 13 fairway, this grand home with amazing views of the mountains in the front of the home to the panoramic views of the fairways and east mountain views is a beauty. 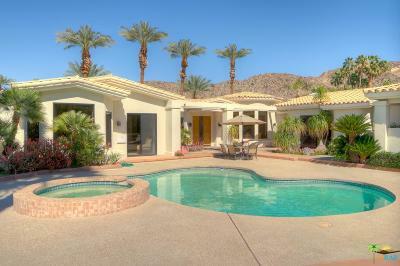 As you walk inside the front gates you have an expansive deck with pool and spa to your left. Once you enter the front doors, you open up to the step-down high beam ceiling living room complete with fireplace and sit down bar overlooking the golf course. To your right you find the elegant formal dining room with high beam ceiling and beautiful wood built-ins. As you progress down the hall you enter the kitchen/family room with fireplace and a breakfast nook overlooking the fairway and mountains to the east. Two guest rooms with their own bathrooms, a powder bath and laundry room complete the east wing of this home. On the other side of the living room is the Master Bedroom with two baths for his and her, each with their own closets. Off of the his bathroom is a well appointed study/library with views.